Driving can be scary. Cars can be scary. Everyone’s most likely experienced some sort of bone-chilling terror at the gas pump over the past few years even just because fuel prices go up! Although the cost of filling up your tank has become the stuff of nightmares..at least your car isn’t displaying a mind of its own or even evil tendencies (even though you might feel that way after pulling out of your station). When a murderous madman goes on a killing spree his weapon of choice is a 1972 Cadillac Eldorado. His rampage is stopped temporarily before he re-emerges with a number of prosthetic limbs and fuses his own body into the car to continue terrorizing those in his wake. Paul Walker and Steve Zahn play best friends on a road trip before deciding to prank people on a CB radio. Unfortunately for them, they crossed the wrong man. Known only as “Rusty Nail,” this angry and murderous maniac on 18-wheels begins stalking and terrifying the two before attempting to drive his 1985 Peterbilt 359 EXHD right to their deaths. Will they be able to outrace or stop this monster truck? Watch and find out. Both a horror movie AND a Christmas movie, this follows a man driving his family to celebrate Christmas with his mother-in-law. A convenient shortcut on the way quickly turns nightmarish as he encounters a mysterious woman in white wandering through the forest, leaving death in her wake. But most of all he is stalked by a terrifying black 1951 Cadillac Funeral Coach – its driver invisible – which carries victims into the heart of the night. And so begins a drive straight into horror and fear. Not the first but certainly one of the best “being stalked by an evil car/driver” movies. A middle-aged Los Angeles electronics salesman driving his red 1971 Plymouth Valiant sedan on a business trip before encountering a grimy and rusty 1955 Peterbilt 281 tanker truck (whose driver is never seen) which begins stalking him in an increasingly deadly game of cat & mouse. The truck was customized for the film, given a shadowy and rusted exterior morphing the American classic into an almost spectral reaper, which is only magnified by the truck’s aggressive exhaust profile, giving it a consistent smoky black aura. An early picture by master filmmaker Steven Spielberg that paints every driver’s nightmare scenario: being consistently stuck on a highway with quite possibly the most dangerous truck driver impeding you path every single mile. You’ll never drive on the highway the same way again. The Oldsmobile Delta 88 was director Sam Raimi’s personal car in high school, and its quad-eyed, thousand-yard stare has made appearances in all of the Evil Dead films. Eventually in the time and genre hoping 3rd installment “Army of Darkness” it gets body armor and spinning death blades attached to it, and faces off against medieval undead. An evil car comes to life and basically becomes the killer in this 1977 slasher flick. The star of cult classic The Car began its life as a 1971 Lincoln Continental Mark III, but was customized by famous movie car maker George Barris. In total, six Continentals were The Car, with a seventh built for an amusement park and then sold to a private collector. Only one example remains, which is good, because if it ever comes to life and tries to kill innocent bystanders, it’ll be easier for James Brolin to deal with only one evil car, not seven. When giant earthquake-causing man-eating worms threaten a small Nevada town called Perfection, a few folk decide to exterminate these pests for good. One of their tools for this trade is a 1963 Jeep Gladiator J20 driven by Kevin Bacon’s character Val until its tires get eaten by one of the giant, angry worms, or Graboids. For Tremors 2 the truck is back, with different markings on its side. That truck is actually the remains of three other Gladiators all combined because the producers for the film couldn’t find another one for sale. If you ever see a giant Chevy van like the one from Jeepers Creepers, you may want to start running. The “mysterious driver” is none other than the “Creeper” a Man-Bat-like demon who awakens every twenty-third spring for twenty-three days to feast on human body parts and organs, to repurpose as his own. There is no way anyone would want to stay on the road stay with that distinct vehicle around. This movie completely warps the image of the 1941 Chevrolet Cab Over Engine for anyone who sits down to watch it. “Stuntman” Mike (played by Kurt Russell) has a thing for big, scary muscle cars and taking people on dangerous rides. He starts the film with a 1971 Chevy Nova, but after his first deadly crash with a trio of beautiful women he switches to a 1969 Dodge Charger. Both cars on their own are not particularly terrifying, but when “Stuntman” slides behind the wheel, they instantly become “Death Proof” (meaning he’s always safe inside) killing machines. Probably the most well-knows “haunted car” movie, Christine, based on the Stephen King novel of the same name, was a 1958 Plymouth Fury. In that year alone a 350ci V8 was available, which got the car from zero to 60 in a quick 7.7 seconds. Of course, not evil, personality-altering effects were not noted during that test that we know of. When a teen get’s his first car it seems like love at first sight…but Christine is a jealous one and the relationship warps the boy’s mind as quickly as Christine goes homicidal. Christine is the most famous car of the Fury line, although the Plymouth would did have another starring (but less terrifying) role in the 1971 film The French Connection. These movies are fictional, some even too ridiculous to be real but they remind us that the real scares of the road really aren’t that big a deal compared to make-believe terror. 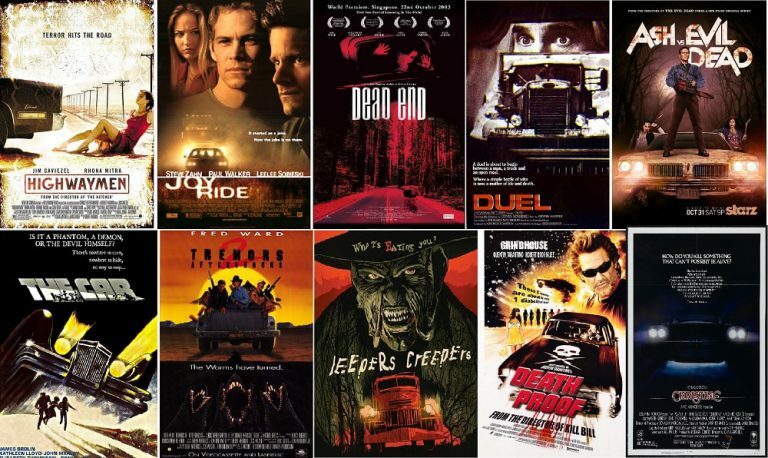 Do you have a favorite auto horror film? Let us know what car gives you chills faster than an over-active air conditioning unit and share!